Take Them To Church? Madness! Oh lads I’m not the better of it! Three kids at Mass on my own…what in the world ever made me think that was a trick I could pull off?! Actually, I know how this happened. I was caught off guard last Friday with a stealth attack by the school secretary. Clever girl she is! While I was up to my eyes in whatever I’m usually up to my eyes in (laundry, dishes, peacekeeping, faeces…pick one or more than one. 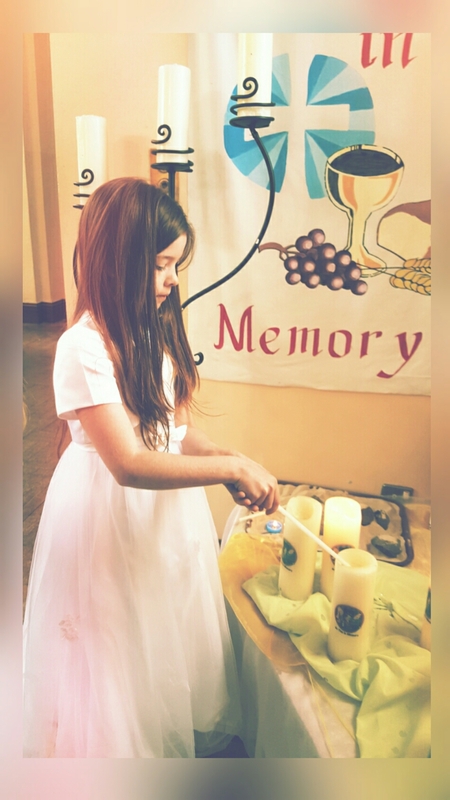 I multitask) she called to see if Lily and I would be part of a lighting of candles ceremony on Sunday for the final mass in the Communion celebration series. (We’d had 8 of these masses over the school year to celebrate the kids making communion). Well of course I wanted to be seen to be pro active in both community and school so I of course said Yes, Yes we’d love to! When it comes to these early morning weekend activities, be it hobbies or Irish dancing competitions or mass on a Sunday I generally do it alone and that’s because their daddy (the gigging musician) is usually after travelling length and breadth of the country and worked more hours between Thursday and Sunday than other people work in a fortnight. He’ll be in an exhaustion induced coma so we leave him to it with soft kisses and light whispers of ‘see you later daddy’. Anyhow. We’re late. If you want to think of us dependable you totally can. Dependably late. I’ll save you the details of the ereatic and fraught feeding and washing and dressing of the three kids except to say this morning the 4 year old learned how to put shoes on a 2 year old and the 8 year old learned to operate the hair-dryer alone! When you do eventually arrive at the church and your aware that the opening act has began, you need to get to a seat quickly and quietly so avoid the centre aisle. I thought I was being clever ushering the gang up along the side behind the cover of marble pillars and floral displays. We walked . We walked further. We looked for an easy to slip into pew. Closer and closer to the top. Finally spotting a vacant row we ducked in, sat down, put toddler off hip onto seat, checked the mobile was on silent, fixed the upturned collar on Morgan’s shirt. .. looked up and …ah crap. Front row. Front and center, How did I not notice I was doing that?! So the madness begins. It’s impossible to keep a toddler in any way still or occupied for 40 minutes. Morgan was in foul humour because I had confiscated a lollypop he’d snuck into the car so he whined and gave out relentlessly. Then he realised he wasn’t getting “holy bread’ and that set off a melt down. I heard my own voice ridiculously promise to ask the priest if he could make his communion today! Naturally when we went through the holy bread ceremony and I didn’t keep my promise it set off another round! “Whyyyyyyyy? Buy Whyyyyyyyy didn’t you ask?”…. And then the real fun happened. Oh man was my composure ever compromised next? You don’t want to look hassled. You don’t want to look like the woman who can’t control her kids. You want to look calm and zen and like your joyously entertained by these adorable skallywags. Even if you’re just not. There was, I am not joking you, and audible gasp from the congregation as all and sundry were sure he’d land on his head on the tiles the other side. Oh I can move when I need to and by the teeny belt loop of his denim shorts and the power of my index finger alone I scoped him back up and onto my knee again! We had taken front and centre seats in a T-shaped church giving ourselves a left and right and all around audience for the Chaos of 3 to preform their show of insanity, comedy and death defying feats. Kept my game face on though! I put on a show of my own and not a bead of sweat or a narky mammy face did I put forth. And I got myself out of there faster than a … Can’t think of anything but fast! Spencer scrambling through my bag to get my lipstick, painting pink tribal stripes on his cheeks. And the candle lighting ceremony, the reason we were there?! Missed it. Turns out that was the opening act so we did it quietly at the end!! Take them to Church? Never again. At least never alone again! !